ZenSpace supplies on-demand meeting rooms small business owners can book through an app to meet colleagues and clients in otherwise noisy environments like airports. Small Business Trends spoke with Mayank Agrawal, CEO and founder of the company. The idea for these soundproofed pods catering to freelancers, salespeople and remote workers plus others was born during a backpacking and business trip in Europe. The result was a series of quiet on-demand spaces where small business people can set up meetings with someone face to face. The process to book one of these WiFi enabled soundproofed rooms is simple. ZenSpace has a mobile app that allows you to find a room, book it and then share it. You can unlock the door to the pod with the same app and recharge your devices inside. Agrawal says staying on top of the innovation curve was a central focus. “There’s smart lighting and temperature control so a human being is not required to manage it,” he says. The pods are also great for events and conferences to get the word out on your goods and services in a private setting. They can also be branded with digital and print wraps on both the outside and inside. The idea appeals to small businesses in need of the service the pods provide and even to those with space they aren’t using to full potential. “There’s space providers on one side of the equation and users on the other,” Agrawal says, noting ZenSpace is a great way to utilize unused real estate. These spaces are affordable as well with Agrawal telling Small Business Trends the cost ranges between $20 US and $40 US per hour to rent one of the pods. He supplies one real world example with a good ROI. These pods offer several different amenities including a Smart Lock, WiFi, speakers and a television set. Currently there are ZenSpaces available in Las Vegas, San Francisco and Sunnyvale, California. One of the other advantages to smaller businesses is the fact there’s no contracts to sign since everything is done by the hour. 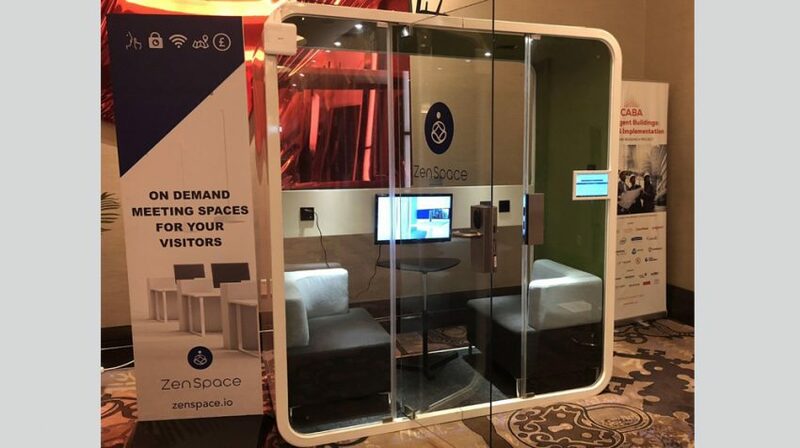 ZenSpace also looks to tackle another problem facing modern small business — namely the lack of face to face interaction due to technology. “I can’t make a deal with someone on a phone far away,” Agrawal says, while pointing out his product uses technology to bring people together physically. To date, they’ve noticed a strong interest from conventions in Las Vegas and big opportunities in airports. Why Cold Emailing is Still, Er – Hot?